The Young Invincibles hosted a webinar on Monday, December 11, titled “Open Enrollment Final Push Conference” featuring special guest speakers (former) President Barack Obama and (former) Acting Administrator of CMS, Andy Slavitt. President Obama thanked everyone who does the “on-the-ground “ work for their efforts and their commitment to getting individuals health care coverage despite partisan politics. He also noted that the goal was, and is still, to have “a health care system that works for everyone”. Former First Lady Michelle Obama chimed in too! Former CMS Commissioner, Andy Slavitt, also thanked everyone and said that “everything you have done makes a difference”. Both speakers encouraged people to remind everyone of the December 15th deadline coming up this Friday, and they encourage people to tell everyone to use social media (Facebook, Twitter, and Instagram) to tell their friends noting that “everyone is at risk if they don't sign up by December 15th." 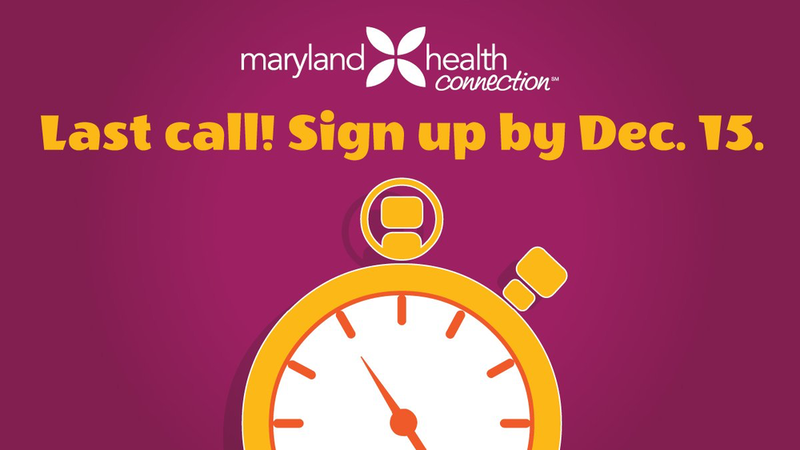 Visit MarylandHealthConnection.gov today. It’s the only place you can get financial help with your health plan. In fact, 9 out of 10 people who got covered through Maryland Health Connection got financial help that lowered the cost of their plan.